In the early 1960's, Conrad Hilton set out to create a hotel which would replicate that of the Royal Hawaiian before Waikiki mushroomed around it - one whose guests could enjoy serenity, privacy, an uncrowded strand, beautiful rooms, and marvelous food. In January 1964, he opened the doors to the Kahala Hilton, a ten-story hotel in an exclusive enclave just minutes from Waikiki with environs that included a secluded sandy beach and a posh, private golf course. Although bookings initially suffered from "too far from Waikiki" syndrome, the hotel soon capitalized on its relatively removed location, thanks to its entrée to the Hollywood community. Not long after the hotel's opening, the management of NBC booked every room for its annual affiliates meeting and brought in a bevy of Hollywood stars. Recognizing its potential as a celebrity hideaway, ownership launched an advertising campaign targeted at film and television luminaries. Word quickly spread of this elegant and exclusive hotel and the Kahala soon placed on the map for discriminating world travelers. By 1967, it achieved a remarkable 90 percent occupancy rate and sealed its reputation as a watering hole for the extremely wealthy and hugely famous. 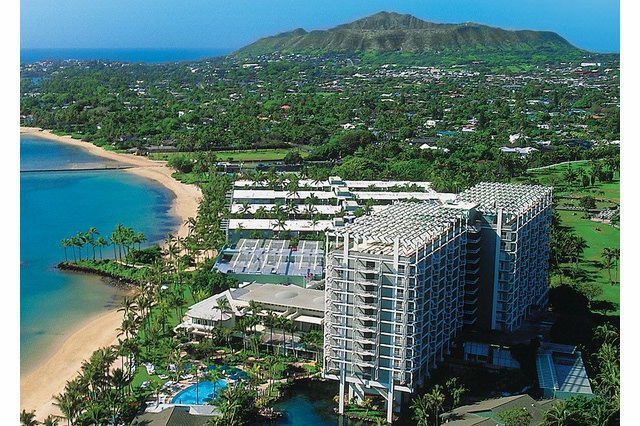 The Kahala Hilton attracted countless film and television stars with its exclusive setting, exemplary service, and its regard for protecting the privacy of its guests. Weekend afternoons around the pool were a veritable who's who of the silver screen, with the like of John Wayne, Frank Sinatra, Lucille Ball, Eva Gabor and Julie Andrews languishing in chaise lounges with sunglasses and cool drinks. Notables such as Jack Lemmon, Jerry Lewis, Johnny Carson, Tony Bennett and Carol Burnett signed their names to the register and Burt Reynolds, Bob Newhart, Bette Midler, and Liza Minelli all took up momentary residence. When "Hawaii Five-O" began filming in 1968, actor Jack Lord arranged for guest stars to stay at the Kahala Hilton, including Helen Hayes, Martin Sheen, and William Shatner. In the 1980's, "Magnum P.I." guests enjoyed the same relationship; the hotel and its beach bar were even features in many of the series' segments. The Kahala Hilton also became the hotel for royalty, heads of state, and legends of the sporting, musical, and literary worlds. Queen Elizabeth and Prince Phillip stationed themselves at the hotel when coming through the islands, as did Emperor Hirohito, Prince Rainier and Princess Grace, Juan Carlos and the Queen of Spain, Indira Ghandi, and the Dalai Lama. Prince Charles and Princess Diana once booked 100 rooms for their party's stopover and Imelda Marcos often stopped in for lunch. Every president since Richard Nixon has walked on the hotel's special red carpet in the Presidential Suite. Sports heroes from Joe DiMaggio to John McEnroe have walked Kahala Hilton's sandy beach and writers James A. Michener, Phillip Roth, Joan Didion, and John Gregory Dunne sought inspiration in its solitude. Concert stopovers found the Rolling Stones, The Who, Sha Na Na and The Beach Boys seeking refuge from autograph hounds and photographers, and Stevie Wonder got permission to swim with and touch the hotel's famous dolphins. Merv Griffin conducted an impromptu sing along one night at the lobby piano with Helen Reddy, Eydie Gorme and Jim Nabors. Despite its reputation for attracting the rich and famous, the hotel also became a legendary gathering place for Honolulu's local society. Its restaurants became Oahu dining institutions for celebrations and quiet dinner alike and entertainers cultivated loyal fans with their nightly lounge shows. Oahu school children looked forward to their turn to visit with the hotel's dolphins through the hotel's daily educational program. And the Kahala Hilton was often the choice for holiday weekends away from home, thanks to it welcoming nature. The hotel's caring employees attended to all of their guests with passion and pride, whether serving the Sultan of Brunei, Luciano Pavarotti, or the Smiths from Dubuque. Returning guests count on such preserved familiarities as the performing dolphins, the lobby's multicolored chandeliers, and the many familiar employees, while enjoying revitalized guest rooms, spectacular dining facilities, and the hotel's signature service. The resort's poolside has once again become a favorite for entertainment stars such as Sir Elton John, George Clooney, Drew Barrymore, Janet Jackson, Whitney Houston, Nicolas Cage, Yanni, Billy Joel, Alec Baldwin, Sean Penn, Adam Sandler and Michelle Pfeiffer. The Dalai Lama visited in 2012. The Kahala Hotel & Resort evokes Hawaii's nostalgic era of timeless elegance. The 364-room beachfront resort features panoramic views of the Pacific Ocean, Diamond Head Crater, Ko'olau Mountain Range and a private lagoon with six resident Atlantic bottlenose dolphins. You can visit the hotel's Web site at www.kahalaresort.com.